Virtually all the native races of Africa are represented in Nigeria, hence the great diversity of her people and culture. It was in Nigeria that the Bantu and SemiBantu, migrating from southern and central Africa, intermingled with the Sudanese. Later, other groups such as Shuwa-Arabs, the Tuaregs, and the Fulanis, who are concentrated in the far north, entered northern Nigeria in migratory waves across the Sahara Desert. The earliest occupants of Nigeria settled in the forest belt and in the Niger Delta region.Today there are estimated to be more than 250 ethnic groups in Nigeria. While no single group enjoys an absolute numeric majority, four major groups constitute 60% of the population: Hausa-Fulani in the north, Yoruba in the west, and Igbo in the east. Other groups include: Kanuri, Binis, Ibibio, Ijaw, Itsekiri, Efik, Nupe, Tiv, and Jukun. Kanem-Borno: While there is no direct evidence to link the people of the Jos Plateau with the Nok culture, or the Eze Nri of today with Igbo Ukwu, the history of Borno dates back to the 9th Century when Arabic writers in north Africa first noted the kingdom of Kanem east of Lake Chad. Bolstered by trade with the Nile region and Trans-Saharan routes, the empire prospered. In the next centuries, complex political and social systems were developed, particularly after the Bulala invasion in the 14th Century. The empire moved from Kanem to Borno, hence the name. The empire lasted for 1,000 years (until the 19th Century) despite challenges from the HausaFulani in the west and Jukun from the south. Hausa-Fulani: To the west of Borno around 1,000 A.D., the Hausa were building similar states around Kano, Zaria, Daura, Katsina, and Gobir. However, unlike the Kanuri, no ruler among these states ever became powerful enough to impose his will over the others. Although the Hausa had common languages, culture, and Islamic religion, they had no common king. Kano, the most powerful of these states, controlled much of the Hausa land in the 16th and 17th Centuries, but conflicts with the surrounding states ended this dominance. Because of these conflicts, the Fulanis, led by Usman Dan Fodio in 1804, successfully challenged the Hausa States and set up the Hausa-Fulani Caliphate with headquarters in Sokoto, commanding a broad area from Katsina in the far north to Ilorin, across the River Niger. Yoruba: In the west, the Yoruba developed complex, powerful city-states. The first of these important states was Ile-Ife, which according to Yoruba mythology was the center of the universe. 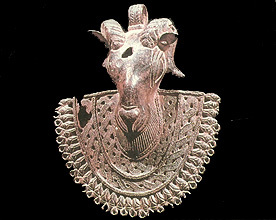 Ife is the site of a unique art form first uncovered in thel93Os. Naturalistic terracotta, bronze heads and other artifacts dating as far back as the 10th Century show just how early the Yoruba developed an advanced civilization. Later, other Yoruba cities challenged Ife for supremacy, and Oyo became the most powerful West African kingdom in the 16th and 17th Centuries. The armies of the Oyo king (Alafin) dominated other Yoruba cities and even forced tribute from the ruler of Dahomey. Internal power struggles and the Fulani expansion to the south caused the collapse of Oyo in the early 19th Century. Benin: Benin developed into a major kingdom during the same period that Oyo was becoming dominant to the west. Although the people of Benin are primarily Edo, not Yoruba, they share with Ife and Oyo many of the same origins, and there is much evidence of cultural and artistic interchange between the kingdoms. The King (Oba) oE Benin was considered semi-divine and controlled a complex bureaucracy, a large army, and a diversified economy. Benin's power reached its apex in the 16th Century. IGBO AND THE DELTA STATES Many Nigerian cultures did not develop into centralized monarchies. Of these, the Igbo are probably the most remarkable because of the size of their territory and the density of population. Igbo societies were organized in self-contained villages, or federations of village communities, with a society of elders and age-grade associations sharing various governmental functions. The same was true of the Ijaw of the Niger Delta and people of the Cross River area, where secret societies also played a prominent role in administration and governmental functions. But by the 18th Century, overseas trade had begun to encourage the emergence of centralized systems of government. Stay up-to-date with latest information from the embassy. © Copyright 2019 - Nigeria High Commission KL. All Rights Reserved.